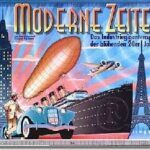 I first had the opportunity to play Age of Steam late one night at the infamous Jung Hotel during my journey to the legendary Spiel show in Essen, Germany. The room was bursting at the seams with folks playing games, but six of us managed to squeeze into a corner and play the game. 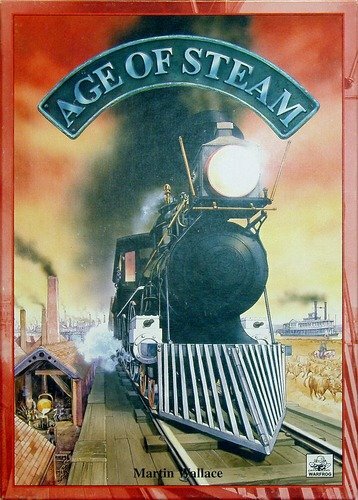 Although I played the first half of that game attempting to develop some sort of strategy or plan, I still have Picture of ‘Age of Steam’very fond memories. Not only was the game outstanding, but we all got a great laugh out of witnessing designer Martin Wallace have a glass of beer spilled in his lap and watching as Dr. Steve Owen, who helped teach and demonstrate the game dozens of times during the Essen show, was mercilessly bounced from the game at the conclusion of the first round by a particularly evil play! First, let me state flatly that I’m a big fan of Volldampf, the TM Spiele version of Martin Wallace’s earlier Lancashire Rails. After hearing me sing its praises, Martin mentioned to me that if I enjoyed Volldampf so much, I would likely love his next game. Well, he was right. 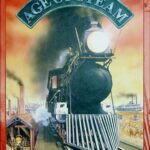 Age of Steam is nothing short of fantastic. The game is the next step on the evolutionary track for Lancashire Rails and its roots are plain to see. However, there have been numerous enhancements and twists that elevate the game to a new, more tense and richer level. Perhaps the main change is that the train routes are no longer pre-established. 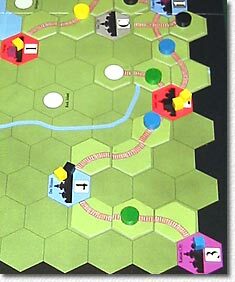 Rather, as in 18xx games, players construct the routes themselves. The board depicts a cross-section of the Ohio valley, with twelve cities already established. There are fourteen other town sites that may be developed into cities during the course of the game. The map has one minor misprint: Detroit should depict the number ‘3’ as opposed to ‘1’. Warfrog has made replacement stickers available to correct this error, but it is also easy to accomplish with your scanner. 1) Issue Shares. As in Volldampf, players may issue shares from their railroads and receive $5 per share issued. However, at the conclusion of each turn, they must pay $1 per outstanding share in expenses. 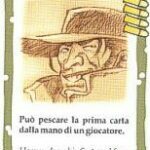 Shares may not be redeemed during the course of the game, so players must weigh this regular expense against the benefit of acquiring the extra cash. Further, each outstanding share at the end of the game reduces a player’s victory points by 3. Ouch! 2) Determine Player Order. This recreates the clever turn order mechanism found in Volldampf, wherein players bid cash to determine the player order for each turn. The first player to drop out of the bidding process will go last in the turn order, but he does not pay any cash for this right. The last two players participating in the bid must pay ALL of the cash they bid when they drop out of the process. All players in between must pay half of their bid amount, rounded up. a) First Move. This player may move goods first. b) First Build. This player may build track first. c) Engineer. This player may build up to 4 segments of track, as opposed to the normal 3 that are allowed. d) Locomotive. This player may upgrade his engine to the next level, which allows him to traverse more rail segments when moving goods. e) Urbanization. This player may place a new city marker on one of the fourteen possible town locations. f) Production. Before placing new goods markers onto the board, this player may place two new goods markers on the Goods Display charts. g) Turn Order. This player may elect to pass ONCE during the bidding process and jump back into the bidding. 4) Build Track. Each player may construct up to three segments of track per turn (with the exception of the player who chose the ‘Build Track’ ability, who may build four segments). The cost of building a track segment ranges from 2 – 5 gold, depending upon the type of terrain being traversed and whether a player is upgrading the track from a previously laid track. As in Mayfair’s Streetcar (Winter 1997 GA REPORT), players can upgrade a previous track segment provided all previous track directions remain intact. The objective here is to construct track in such a manner as to form completed routes between cities. It is across these routes that goods may be moved from city to city, earning income for the players who control the segments across which theAge of Steam – board goods are moved. So, it is critical to construct track routes that your opponents will also be forced to utilize when moving goods, thereby earning you money. It is also wise to construct contiguous track routes, so that you can use primarily your own routes when moving goods. 5) Move Goods. This is virtually identical to the Volldampf rules. Each player may move two goods on their turn, but they may not exceed the number of ‘links’ (city to city routes) indicated by the current level of their locomotive. For instance, if a player has a locomotive level of two, then he may only move goods a maximum of two city-to-city links. This is why upgrading your locomotive is so important. The downside is that for each level of your locomotive, you must pay $1 at the end of the turn in expenses. Did I mention that money is very tight? A brilliant addition to the system is the Goods Display chart. These charts list all of the cities on the board, as well as the potential cities. At the beginning of the game, these charts are filled with goods. Each turn, dice will be rolled to determine which goods are placed on the board. Since the location of the goods is pre-determined, players can study these charts and make their plans accordingly. 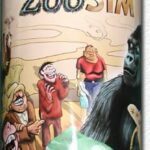 Although the timing of the appearance of the goods is determined randomly, one can ‘play the odds’ with some degree of certainty that certain goods will appear at certain cities. 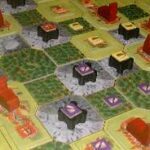 The ‘Production’ ability gives a player the right to place two new cubes onto the charts, increasing his chances of getting desirable goods onto the board at the location most favorable to him. 6) Collect Income. When moving goods, each ‘link’ traversed increases the income by one space for the player who owns that link. This is recorded on the Income track. During this phase, all players receive income equal to their current position on this track. 7) Pay Expenses. Time to pay the reaper. For each outstanding share and each level a player has achieved on the Locomotive track, players must pay $1. In the early stages of the game when income is extremely tight, players must exercise the utmost caution in their financial management. If a player is unable to pay their expenses, their marker is moved down on the income track one space for each $1 they are unable to pay. Another “ouch”. 8) Income Reduction. As the rich get richer, Uncle Sam steps in and increases his taxes. This is a clever ‘catch the leader’ mechanism wherein as players enter certain brackets on the Income Chart, they are forced to pay a stipend to the government and move their marker backwards on the chart. The first bracket is 11 – 20, wherein a player must move back 2 spaces after collecting their income. Brackets rise in increments of 10 spaces, with each subsequent bracket forcing a player to move back two more spaces than the previous bracket. Often, players will attempt to play the movement of goods so that they do not enter the next bracket. Of course, their more devious opponents will often utilize their track as part of the movement of goods so that the player is knocked into a higher level and will suffer income reduction. 9) Goods Growth. At this point, after the player who selected the ‘Production’ ability places two new cubes onto the chart, dice are rolled to place more goods from the Goods Display charts onto the board. The Goods Display has two charts, one for each side of the board (east & west). Each chart contains columns for the six cities and four possible towns. There are three cubes that can appear for each city and two for each town, plus any that are placed due to utilizing the ‘Production’ ability. In most of my games, all of the city cubes have been placed during the course of the game and a bit more than half of the town cubes. The length of the game is determined by the number of players. With six players, the game is completed after six turns. With three players, the duration of the game is 10 turns. Our group tends to play fairly slow, so our six player games have lasted about three hours. However, it has been three hours of tense excitement, so the time truly flies by. Age of Steam has some outstanding production values, with thick cardboard tiles, a functional, easy to read mounted map, lots of wooden cubes and markers and plastic chips for money. The rules are good, but not without some ambiguities. Fortunately, Martin and several of his Warfrog crew are active on various internet discussion groups and have provided answers to the few queries which have arisen.